TEN spring water – At a 10 pH, TEN spring water not only hydrates but also is rich in electrolytes – which help prevent the harmful effects of dehydration that can occur when your body is exposed to high temperatures – definitely a concern here in South Florida. Harmless Harvest Coconut Water – This is hands down the best-tasting coconut water on the market. Not too sweet, this organic raw coconut water is made from a responsibly harvested, exceptionally sweet and fragrant coconut variety native to Thailand which gives this drink a beautiful nutty finish. 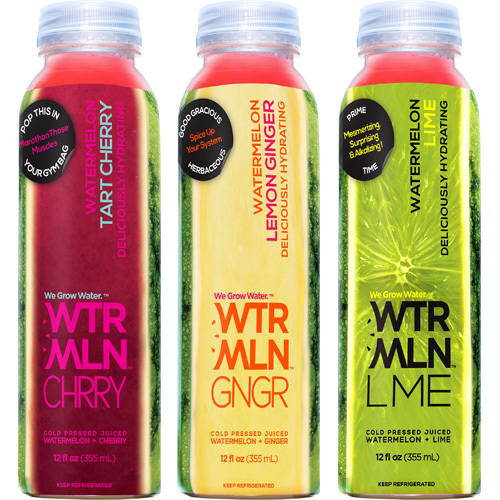 WTRMLN WTR – Sourced straight from the watermelon fruit, WTRMLN WTR is incredibly hydrating and rich in beta carotene and lycopene which will give the body protection from UV light. We are especially in love with the new BLNDS line which includes WTRMLN GNGR (Ginger Lemon), WTRMLN LME (Lime), and WTRMLN TRT CHRRY (Tart Cherry) which are all made with WTRMLN WTR’s deliciously hydrating base of watermelon (flesh + rind) and the addition of organic juices and organic extracts. For an extra health boost bring along some packs of HFactor Hydrogen water—water that’s been infused with the odorless, tasteless gas. Consuming hydrogen water (and bathing in it) has been a health craze in Japan for years, not only offering crazy hydration but also supplying a slew of health and beauty perks, like antioxidant protection, workout recovery, improved circulation and energy, reduced allergic reactions, and suppressed eczema. The first brand to market hydrogen water in the U.S., HFactor has now brought the product stateside. Florida-based Corkcicle makes a slew of genius products designed to keep your drinks nice and frosty at the beach. Beer lovers will appreciate the Chillsner, the only in-bottle, drink-through beer chiller. Just freeze the insert into any bottled beer, press firmly to to create an airtight seal, and enjoy. It’s like an icicle for the your brew-dog. The Arctician takes the typical “koozie” can cooler concept and makes it less tacky and more functional. It keeps 12-ounce drinks cold without making your hands cold and lasts for up to 3 hours. If wine or mixed drinks are your thing then the 16-ounce Canteen is the best bet, keeping drinks ice-cold for up to 25 hours. You’re going to need some fine finger foods, fancy cheeses, prepared salads and baked goods to pull this award-winning picnic together so a trip to South Beach’s Epicure ought to do it. Choose from dozens of gourmet salads (we love their classic tuna fish and the chopped Israeli-style salad) along with fresh-baked goods and a phenomenal cheese section. Throw in a container of fresh-cut fruit, some olives and crackers and you’ll be the envy of everyone on the sand. In order to take this picnic from good to great you’ll need some appropriate quaffs. For those who want a little kick with their sparkling water there’s Truly Spiked and Sparkling, a low-calorie malt beverage in flavors of lime, grapefruit and pomegranate. Jose Cuervo has now created Ready to Drink Margaritas in flavors of white peach, grapefruit tangerine and strawberry lime. For more fruity margarita swilling there’s also the Lime-A-Rita cans that also come in flavors of Grape-A–Rita, Peach-A–Rita and seasonal varieties of Pine-Apple-Rita Splash and Coco-Nut-Rita Splash. Beer lovers will be won over by with Schöfferhofer Grapefruit, a super low-ABV refreshing drink that is also the first Hefeweizen grapefruit beer. It’s refreshing on its own but also serves as a great mixer for cocktails.